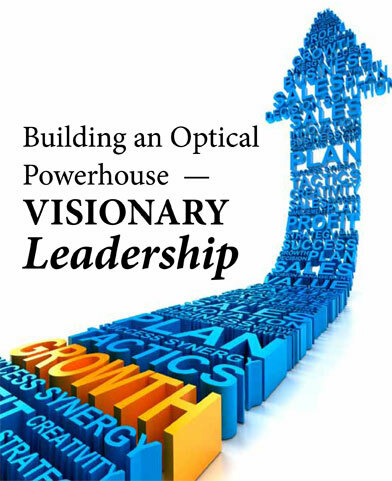 Recently I was challenged by a friend to revisit the vision statement for my retail optical location. I have spent the last 15 years building an optical practice alongside an independent doctor of optometry. In the time that I developed this practice I also earned what I like to call my street MBA. Basically I made every mistake in the book and reinvented myself many times. How’s that for credibility? During those 15 years, I took advantage of opportunities to develop my professional interests. I took on leadership opportunities (associations and colleges), training and development opportunities (working with manufacturers and educators), a degree in Health Science Management and a career in management consulting (developing and revitalizing dispensaries and medical practices). Today I find myself in a curious dichotomy. I have a full-fledged, mature eyecare practice and a management consulting career and it is time to revisit my vision for the retail business. So let’s get to more specific terms and discuss the three phases of a business. 1. Build phase: business resources will suggest it takes three years to establish yourself in business. This is a time for rapid growth strategies. The first three years will define the winners of the emerging business battle, but it takes longer to grow a business. In eyecare, our clients typically purchase in two-year cycles. How many cycles must an eye care practice sustain before there is just as much repeat business as there is new business? Let’s assume that five to seven years constitutes a sustainable business cycle. 2. Maintain phase: when a business has reached the maintenance phase a delicate formula of growing at a rate just greater than the rate of loss of clients due to death, geographical changes, loss to the competition and drop out from the industry. This is the time in the business when existing relationships must be nurtured and maintained. Now you increase your per-customer purchases by dollar value and volume instead of hunting for new business. It’s an issue in an economic sense because you have probably reached a large percentage of your immediate community. Depending on the community’s growth trend, you are now drawing from a smaller pool of new clients. It’s time to get the existing client working for you. The business must always have a sustainability plan to deal with environmental factors, such as natural disasters, pandemics, economic downturns and a talent gap. Does your plan include the addition of an associate? How can you reliably and scientifically determine the best fit for an associate without introducing additional risk to the business? The maintain phase means the identity of the practice should be solid. Your clients should easily identify what you do and what your offerings are. 3. Divest phase: is it time to find a successor? An exit strategy is the springboard that will take you to retirement or another venture. This plan should be formulated at least three years in advance of the actual event. If you are planning to sell the business, finding the right buyer can take time. Having a strong cash position at the time of the sale gives you more time and greater options. Do you want to sell? Do you have to sell? Have you reached the pinnacle of your career and now want to wind down? Do you have health concerns or a change in family circumstances (eg. caring for an older parent)? Has the business been a burden and it’s time to cut your losses? Is it time to pass the business on to a family member and, if so, how do you manage this transition? As an organizational behaviour analyst, I can tell you that when your business has its best “mojo” it’s because your people strategy is in alignment with your business strategy. In order to build a “powerhouse” team you need to step back and reflect on the phase your business is in and whether your vision for it embodies your goals. It is absolutely acceptable to dream “big” in your vision statement. Your mission statement will then outline how you plan to achieve your goal or goals. However, the vision sets the tone for the business and gives each employee a “go to” place when faced with making decisions during daily operations. To summarize, a practice in the Build Phase would benefit from an assertive workforce, people who are naturally self-starters and comfortable “hunting” for new business. A business that is in the Maintain Phase needs relationship builders who will leverage connections with people. A business that is getting ready to Divest needs cautious, calculating, detail-oriented and by-the-book people. It is the combination of behavioral science and organizational planning that takes a business to the next level.